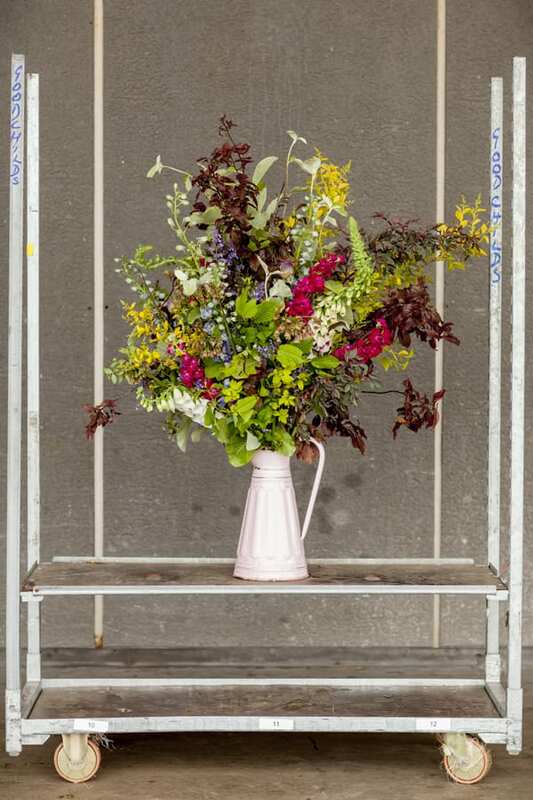 It’s Day Two of British Flowers Week, an industry-wide, nationwide campaign in support of British cut flowers, founded and organised by New Covent Garden Flower Market. I’ve always used British flowers and source them from Pratley at New Covent Garden Flower Market. From April through to October, 80% of the flowers in my shop are British. For a tall arrangement I have created one of our signature designs in an enamel jug (pictured below). The key elements of the design are a wide variety of textures, a warm palette and haphazard natural composition. An arrangement in a ceramic vase has a reduced palette of pink hues. The boat style vase is really enjoyable to create arrangements in as it gives the flexibility to spread the design horizontally. There is also a hand tie which I wanted to move away from the vintage aesthetic. For this reason I excluded pinks. One of the lovely things about using British flowers is that the limited variety of what’s in season pushes you to try new things. What’s you favourite British flower? I love English ranunculus…their colours and the fact that they look like poppies when they open up. I even like the way they look when they’re in their boxes at the Market. They’re such great value for money and I love the fact that this makes them accessible to lots of my customers. I love the fact that they’re uncomplicated, nothing’s ever the same and the fact that you never know what you’re going to get. There’s uncertainly and it can be a lovely surprise. I like to remind people that due to the weather, you can never be sure what will be available. When British flowers are in season, they’re cheaper and you get more for your money. I love the wild style you get when you create designs using homegrown blooms…it suits East London where we’re based. I try as much as I can to educate our customers as I think it’s really important to understand seasons and availability, the same way as people understand about local v imported food. It will be in a similar style to the design which I’ve created for the photo shoot (pictured below) and it will include delphiniums, stocks, ox eye daisies, salvia and foliage. Do check out the new British Flowers Week website for three blog posts featuring Hattie and foliage. 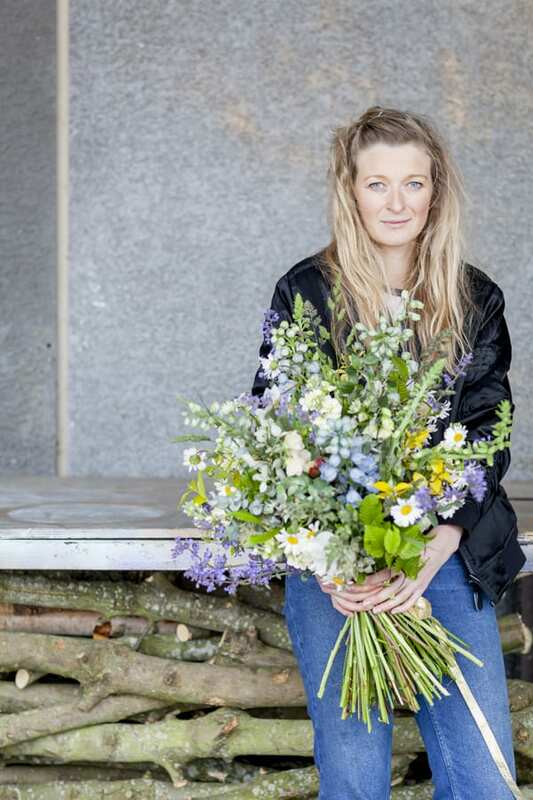 And tomorrow, look out on Flowerona for the next florist and British flower…!